Who doesn’t like a flavorful cheese paired with a nice red wine? I absolutely love the combination. It is as if the two were truly meant for each other. I’m not a connoisseur by any means, but I have been to several wine tastings and have spent quite a few years working as server in great restaurants which offered some very nice wines, so I’ve had the opportunity to experiment. Such food and drink pairings have existed for centuries, and there appears to be a little science behind it. I found this simple wine and cheese pairing chart developed by a chef in California, and I have to say, I have tried some of the suggestions, all of which were lovely. But in the end, properly paired or not, what matters most is that you genuinely enjoyed it. For my little cheeseboard, I used up the rest of the manchego I had in the fridge and then also bought some brie. I could have been a little more adventurous than the brie, but it’s been far too long since I had it last and it wouldn’t stop eyeing me down at the market. But hey, I got the double-cream brie; that creamy goodness contained by the firm outer rind creates such a beautiful texture on the palate. And because peaches and berries have been ruling my kitchen lately, I decided to use them up as well. They also paired superbly with the cheeses. Lastly, thinly sliced multi grain bread and almonds were added to round things off. This dish reminds me of a great restaurant at which I used to work – Tapas, in Tallahassee, FL. They offered a nice little Spanish tapas style menu and were partnered with a winery right next door. 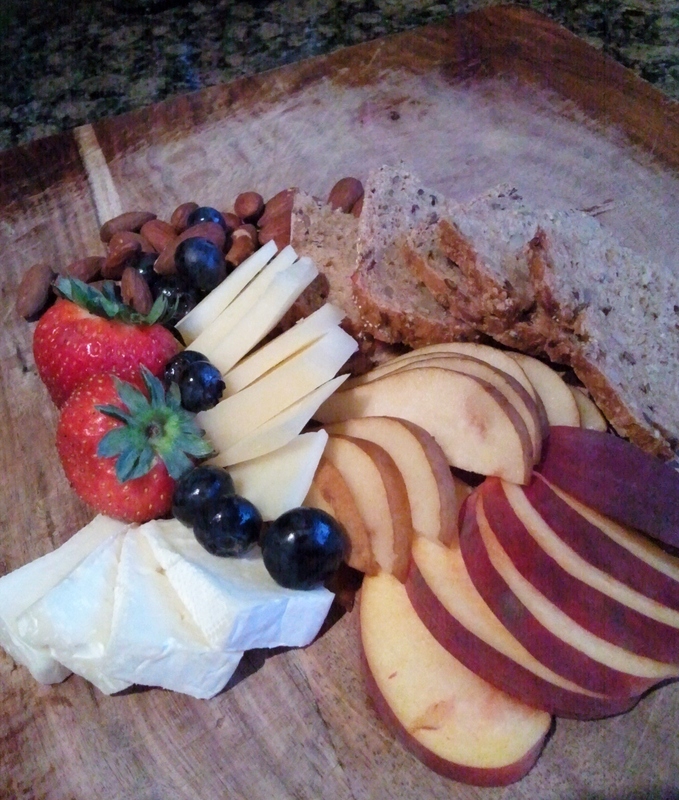 The cheeseboard was a very popular menu item. Stacking a slice of cheese on top of a cracker topped with a thinly sliced peach or pear creates a party in your mouth! I promise! You must try if you haven’t already. Finally, the wine. When it comes to reds, I’m a big fan of the bold and spicy Syrah, Malbec, Tempranillo and Cabernet. 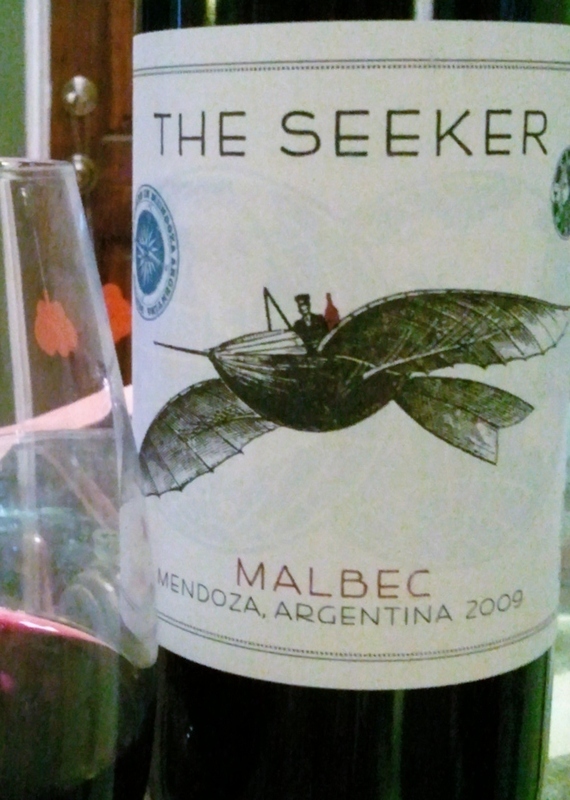 As I was browsing the wine selection of a local market in town (Eat More Produce), I came across The Seeker, an Argentinian Malbec. To be honest, I didn’t really think about whether or not this would “pair” with my cheese selections, and I have to say, the label got the best of me. The Seeker. Argentina. The artsy label. Oh marketing, you really got me this time. The thing is, I’m planning to take a long trip to South America to explore what else this world has to offer and Argentina is on the list. The Seeker. Argentina. It was calling my name. What I accidentally left out of the picture was my dessert! A few pieces of 85% Dark Chocolate. Another wonderful food that pairs nicely with red wine. What are your favorite cheese board selections?